Soooo i gave into my product junkie habit, and signed up for CurleeBox. As you know i have been a subscriber to TreasureTress and this box works similar. I have had my eye on this one since it launched! The boxes just seemed to get better and better and i knew it wouldn't be long before i gave in and joined this one too. This is an amazing first box and those who signed up early were very lucky to get these in their box. 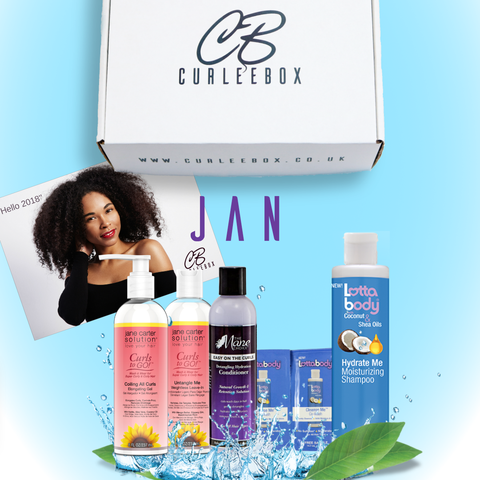 For January box they brought products from Lottabody, The Mane Choice and Jane Carter Solutions. I have tried some products by Lottabody but not the other two brands. The Mane Choice is on my list of brands to try out however. This was the box that made my mind up for me. It featured 4 full sized products from the wonderful Flora & Curl. My instagram followers and blog subscribers will know i have been posting a lot about this brand since falling in love with the hair mist and butter. Seeing 4 of them included in this box proved how great value for money the box is and i knew i had to sign up ... i was too late to get this box though. By the time this box came out it seems a lot more people have discovered them now. 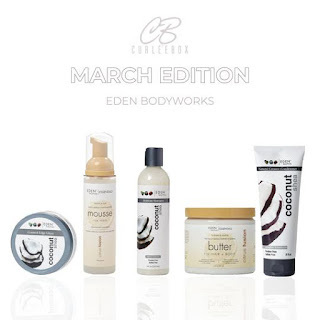 This box featured products from a brand i haven't used called Eden BodyWorks. 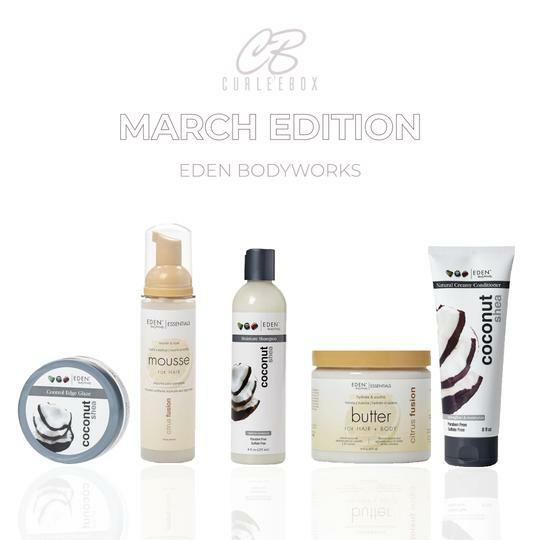 I have seen some beautiful results from people using this brand and it can still be purchased on the Curleebox website for now, if you missed out. The CG monthly box is a new one which started in April and is the same as the normal box, except any products which aren't CG Friendly will be swapped for something else. 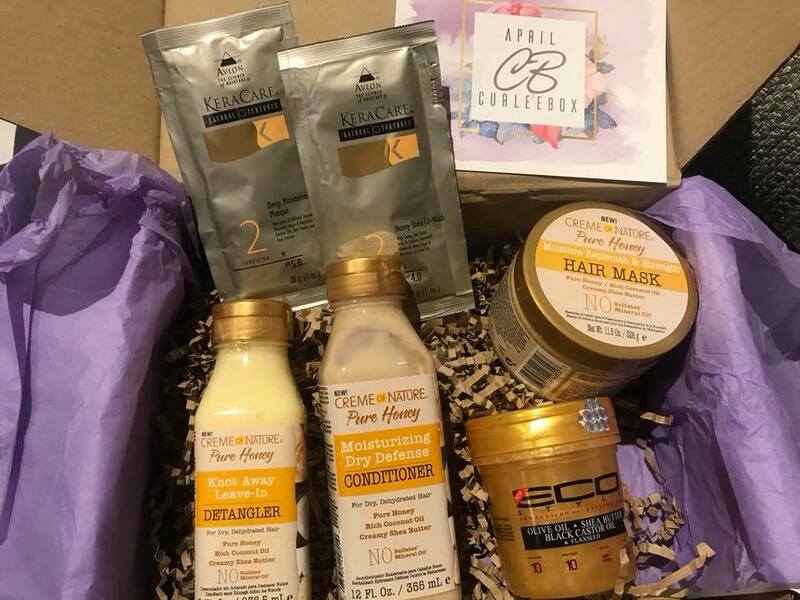 I personally don't follow the CG (Curly Girl) method, but i know plenty who do and so i think it is amazing that this box is catering to those as well. Postage and Packaging is of course charged extra at the checkout. This box also ships internationally. Another thing i found on the website, is that they have a chart which lets you know when your box will be shipped based on when you placed your order. I like this because you know for sure if you have missed out on a box already or if you still have time. It also lets you know how long delivery usually takes based on if you are UK, Europe or rest of the world. So what was in this months box? I recently saw that Creme of Nature had brought out another brand new range. I can't remember which girl it was, but i saw she was sent the full set and it looked amazing. I was so excited to see that it was in this box! It was as if they had read my mind. This is the Pure Honey Range. 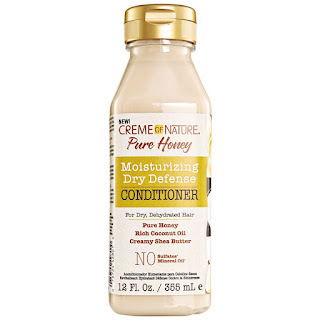 "Creme of Nature Pure Honey collection is infused with a blend of Pure Honey, Certified Natural Coconut Oil & Shea Butter. 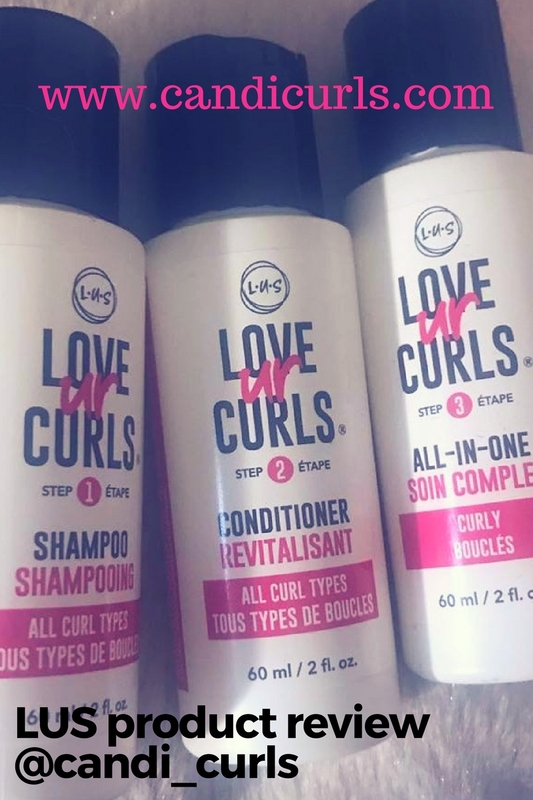 This collection targets dry, dehydrated hair to provide essential moisture, softness and smoothness where your hair needs it, without weighing it down." I liked this product a lot. It really did take away any knots and tangles i had in my hair instantly. It doesn't specify on the bottle if it should be used on wet or dry hair and so i tried it on both. I was happy to find that it worked just as well. 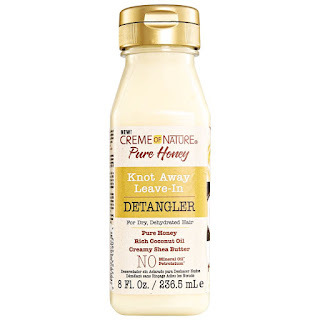 As you know i don't like to wet my hair everyday, so finding a leave in detangler that works on both dry and wet hair is a bonus. It is really lightweight as well. I worried at first because in the bottle it appears to be very thick. I had to really give it a good shake a squeeze to get it out, however once rubbed between hands it became a much lighter creamy texture. Would i buy this product? Yes. 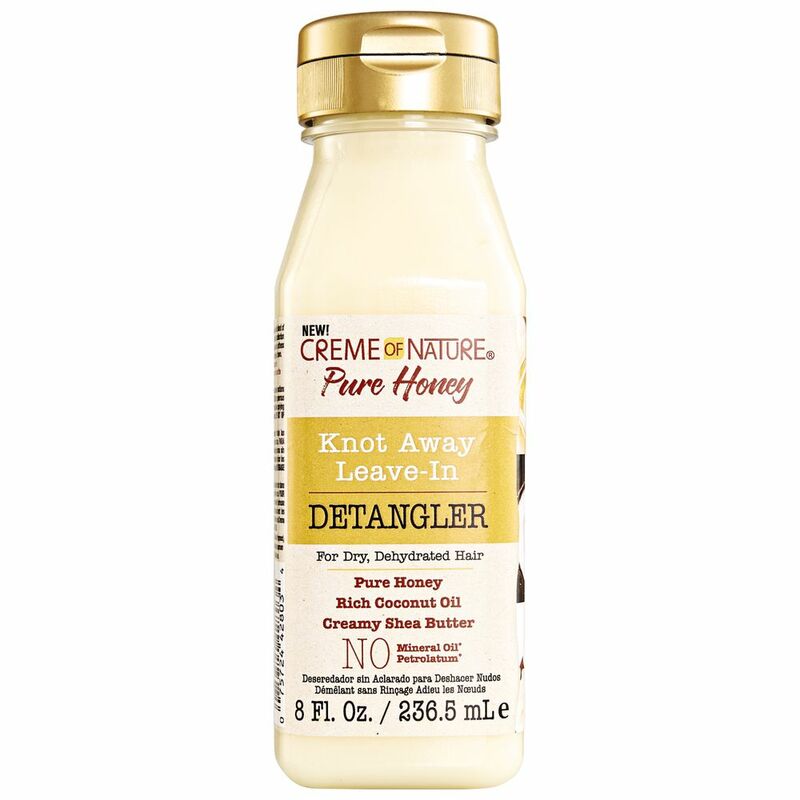 It worked brilliantly as a detangler and my hair felt very soft and smooth. Again this a thick consistency in the bottle, but a lot creamer when poured out. 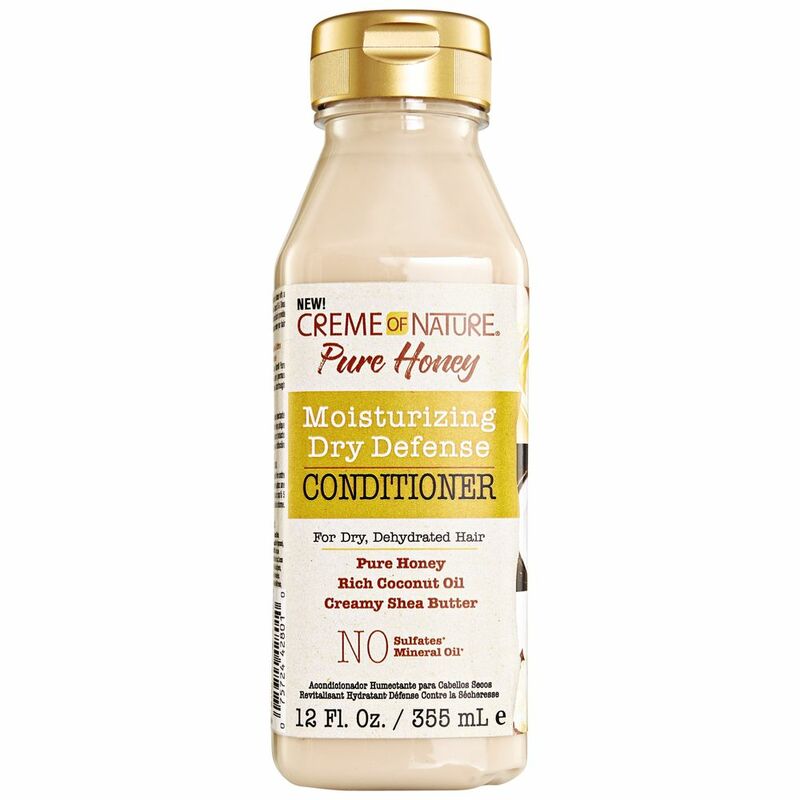 I liked the way this conditioner seemed to coat my hair in a a soft and hydrating film, which allowed me to easily comb out my week old hair. When rinsed off the soft feeling was still left in my hair. I didn't think that the feeling lasted as long as some of my previous conditioners, but as my hair has been recently bleached again and I'm in the process of reconstructing it, i need to try this a few more times. Would i buy this product? So far I'm thinking that maybe not. I need to test this out more. 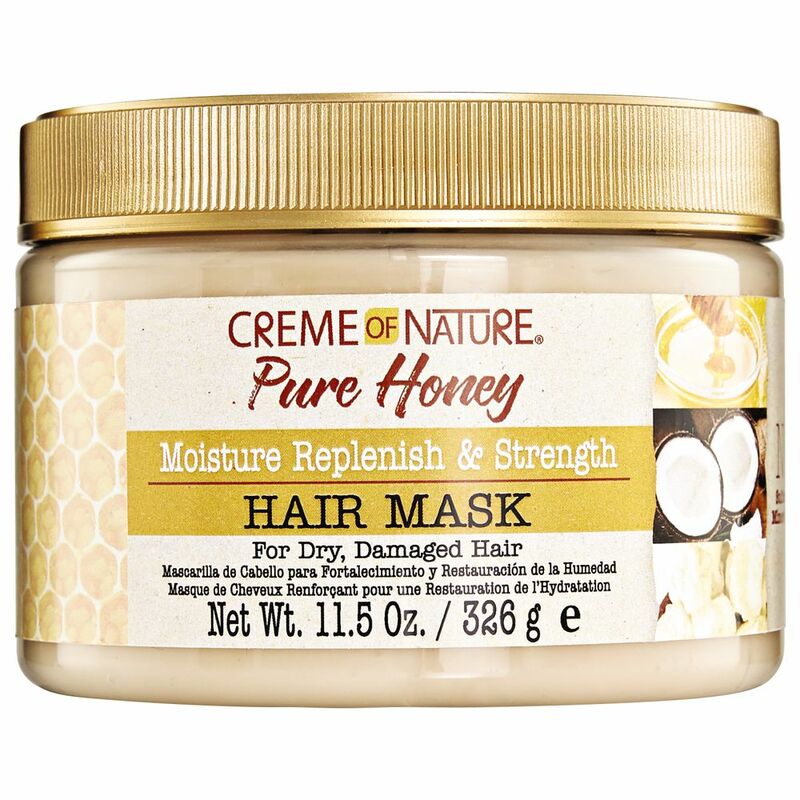 Creme of Nature Pure honey; Moisture Replenish & strength Hair Mask. This is the one i was most looking forward to trying in this Pure honey range. 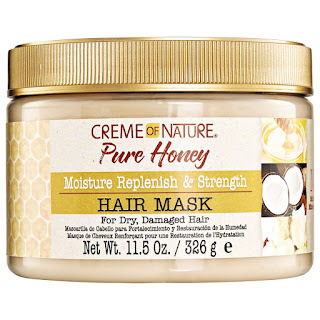 I had just ran out of hair masks, and i have used honey in my DIY one and had excellent results. This one is not in a milk bottle and instead in a tub as most masks are. This makes it easier to get out, although this one is the thinner consistency out of the 3. It has excellent slip and even when applying this and finger combing, my hands were able to glide straight through my hair. Unlike some other masks this one only says to leave on for 5-10 minutes and to apply after shampooing hair. When rinsed i did think that my hair felt softer, but i didn't instantly fall in love with this product. Would i buy it? I'll get back to you on that. Overall i think that this range is ok. I haven't instantly fallen in love with any of the products, and at best like them, not love. I of course will continue to use them until i can 100% make up my mind on them and then update this post. The last product in the box does not come from Creme of Nature. Can we just take a second to re-read and let that sink in. So i may possibly be one of the only curly girls on instagram who has never (until now) used any EcoStyle gels. I have never really been a gel person unless its a cream gel, and even then i tend to stick to what i know. I did a post showing my top gels and asking what everyone Else's were, and Eco Style was the most popular choice. With so many different types out there, i never knew which one to try and so i stayed away from them. I was about to order the Black Castor Oil & Flax seed one when it became out of stock. Imagine my excitement to see this one come in this months Curleebox. It is a combination of most of them, and is a glittery gold, matching the colours perfect. It says on it that the hold is a 10. I disagree. I found the hold to be very light and this made it PERFECT for me. It was the hold that put me off getting it in the first place. 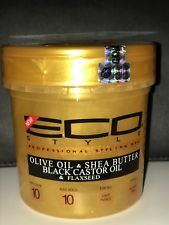 I have used this on my edges and they didn't stick down too long, and i have used it on my bangs. I much prefer using it to hold my curls in place rather than to stick down my hair. My curls didn't feel too crunchy, didn't flake and it didn't feel sticky at all. Would i buy this product? YES! I actually really love this gel its fast becoming a favourite for when i want a little more hold than my creamy gels give me. The box also came with 2 samples from Keracare which i am yet to try. I have tried something from them before which didn't agree with my hair and so i will be waiting to try them again. I am really bad when it comes to using up sample packets. 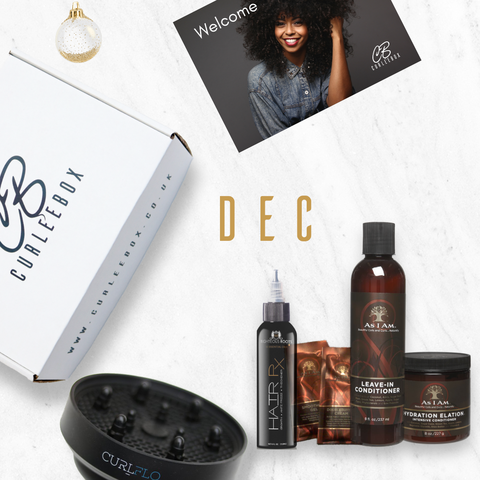 Overall i was impressed again by CurleeBox. Brand new products, products i haven't tried before and all for £20(p&p) a month. The box is very good value for money in my opinion and i won't be cancelling my subscription any time soon. 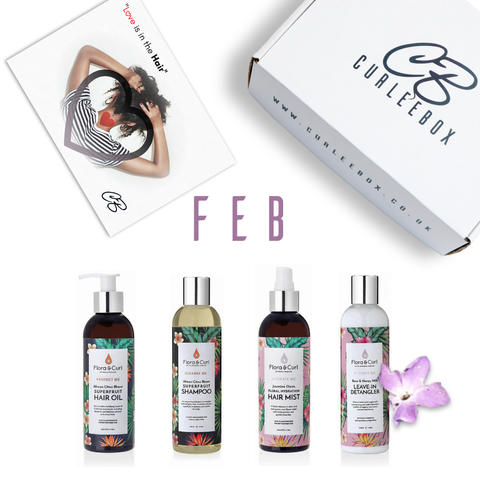 If like me you missed out on the Flora & Curl box, you can save money on all orders direct from www.floracurl.com by using the code "CANDI" at the checkout.